Ah cool, a fellow c++er . It looks quite cool what you made so far. I'm sure there will be many people happy with it. But just fyi, luabridge makes it relatively pain free to bind in Lua if you'd ever want to include such a feature in the future. It's a header only library which provides a pretty convenient c++ wrapper over lua. Together they are much easier to tie in than say JS or python. How is it flexible for changing mechanics of game? Gameplay itself? So you woudn't do just clones of established formulas.. Guess thats main reason why people ask about coding/scripting extension. 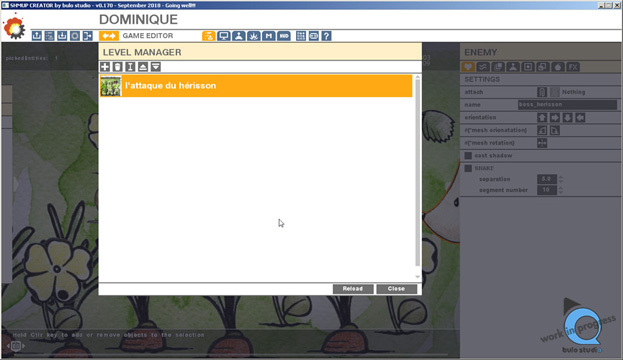 There are a lot of settings to modify the gameplay/score system, and everything is very customizable. That being said, you are right that there is no way to create something nobody ever done before without a kind of code/script. As I wrote before, this tool is not going to be the ultimate shmup game creation tool (not with its first installment, anyway!). If I wanted to do something like this, to be honest I'll made some Unity shmup creation package, and sell it for 80$ on the unity store, and people would have to wrote their own rules in C# and complete their game themselves. My aim it to give people without much coding skill or time to code a way to have fun creating games. You can pretty much do a Gradius or a Danmaku with it in a few days, and I think you'll be surprised by what you can do with it. I'll do it one day, but to stay true to the spirit of the project, it will be a graphical UI, like Unreal blueprint. Is there any updated release time frame or beta road map? Something happened: I had an offer from a company I couldn’t refuse, and I have been working full-time since January. The result is that I don’t have a lot of free time to work on the SHMUP Creator anymore, and it makes my heart bleed. But since last month I have begun to work again, at a slow but steady pace. I’m working on a 2D sample level using sprites. It’s an horizontal shmup, like Gradius or R-type, and it will be part of the package. It also a good way to polish and debug the engine: I’m doing a lot of small adjustments and corrections. Working on this level made me rewrite the sprites animation code. 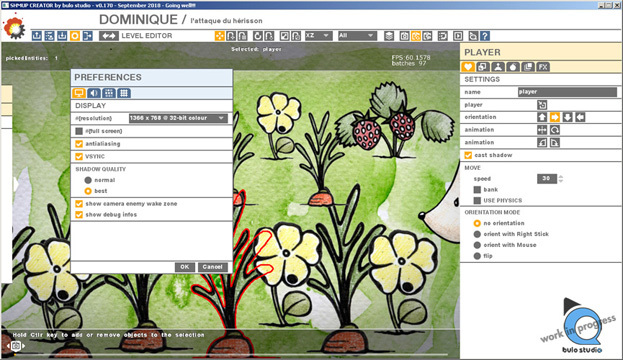 Until now it was using Ogre3D animation technique, where users have to save one picture file per animation frame. 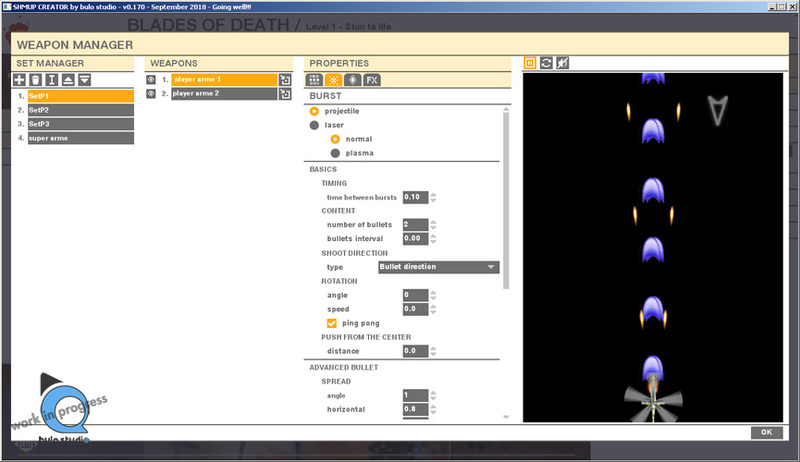 It’s cumbersome and not good for performance, so I wrote a proper atlas animation shader. Now user can put all the animation frames on one sprite sheet and give the tool the number of rows and columns, the animation speed and the shader will do the rest! This is my primary concern: I want to do an Early Access as soon as possible, but I don’t want to give people an unstable build. Another concern is that I want to be sure to stabilize the level’s file format before allowing people to start making games to avoid breaking their creations. I promise to write a follow-up next month, even if it’s a small one. Man, this is exactly why you open source it! When I first saw your thread I immediately wanted to download the code and poke around. (Also it hurts me emotionally that there's no demo build I could tinker with either ). But really, this project is such a good candidate for being hosted on github (or similar.. wait, nevermind, use github ). It's definitely something I would be interested in contributing too. The post I quoted was from a discussion about implementing scripting, but if it was open sauce, maybe Trung0246 would even take a crack at implementing that idea. Is there a reason you have for not open sourcing it? As I wrote earlier, I'm trying to keep the "one post per month" rythm.
. I corrected a lot of issues with the player orientation options: the player can stay in the same direction regardless of it moves, it can flip left-right or top-bottom, it can be oriented in the move direction or with the mouse or pad right stick .
. A new feature is that the player sprite can play an animation when the player press a new direction which allows to animate the bank of the player. It’s something you couldn’t do before with the old animation system, and that it’s quite easy to do now. On of the enemy type is the snake: it’s an enemy made of one or several parts which moves like a snake or a worm… You can use a different object or picture for the head, the body and the tail. Even if its made of several parts its one enemy, at the difference of the pseudo-snake you can create if you spawn a lot of enemies on a path. I created the snake and some animated power-ups. Now, I’m working on a turret. I’m doing some design and UI correction with Mathilde. There are a lot of menus to review, the design of Professor Bulo for the in-game tutorials etc. Did I mention that I corrected some bugs, like I do in every update? As always, slow but steady progress. I plan to keep a monthly update rhythm, so stay tuned! Still trying to keep up the rythm! Keep it up! I am so excited to see the final output. The monthly devblog is still monthly: I'm happy! Good to see that this is actually gaining faster development. I might have forgotten to state if this engine can use low-res resolutions for pixel art. Unfortunately, my credit card seems to have blocked so i don't think i'll consider buying SHMUP Creator. If the new STGBuilder (the one with refined gui and actual english translation) might come out soon (which possibly might be free despite the fact it has been approved for exporting to EXA-Arcadia), i'll grab that instead of SHMUP Creator, but you're still going great. Last post of 2018, a little bit sad, but who knows, it's almost Christmas!!! I tried to post something every month, and as you can see, I failed. This is a good opportunity to write about the difficulty of working on something on the side: it’s really hard! I have a day job, which is taking a lot of my energy right now, a long commuting time and all the things you have to do in real life and outside of work. At the end, there’s not a lot of time left to focus on a complex project. It’s also a balancing act, between the frustration of not making progress during the week-ends and the fact that you want to spend time with your girlfriend, your friends, have some rest, watch a movie…. The last 2 or 3 months, my job and commuting took too much place in my life. I managed to do some work though, but it was also frustrating: all the HUD/start menu/menu editors, which I thought were completed, had really deep and unexpected issues. I found that the previews were not correct most of the time. It was also crashing sometimes, depending of what assets or what settings were used…. This kind of issue is happening a lot with this kind of work, in an editor where everything is interrelated, changing something will cause unexpected issues somewhere else. And even worst, most of the time I’m aware of the issues only weeks or even months later when I test something else. Ok, it’s the “Depressing End of Year Post”, but all this is behind me now. I mean, it’s almost Christmas!!! 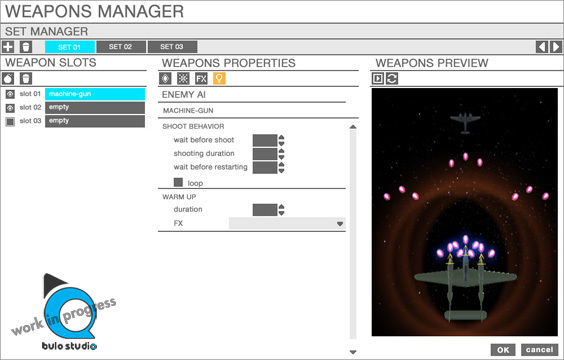 Apart from the usual debug and polish, I finished the modifications on the weapon workflow and editor. I also completed the explosion editor reboot and corrected the controls editor, where you can modify the keyboard and joypad keys and buttons. keep the updates coming! Looking forward to it! Hi everybody, first update of 2019! And a more positive one as well. After the depressing Christmas post, a positive new year post! 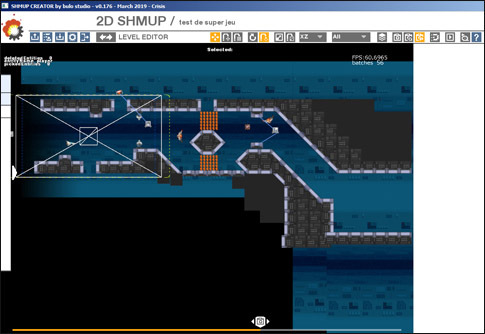 At this point, I’ll soon be able to start designing the level and play with the editor. I already started to test some ideas, and as expected, it’s a good way to find bugs or things with unwanted behavior. 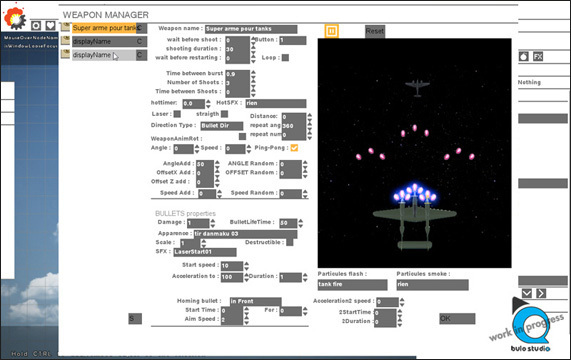 It’s the best way to complete the SHMUP Creator: to really use it. I know it sounds obvious, but even in the pro industry we often don’t have time to do so.
. I fixed some crashes, some annoying bugs (why the turret is moving magically from its base when I go back to the editor?) etc. I’m started a “no priority bugs” list, which is a shame, but is the only way to finish the editor: I know it could be better, and it will be, but I don’t want to diverge too much from my short term goal.
. I did some minor modifications to the UI to streamline the workflow. Sometimes, a really small adjustment makes a great improvement to the look and feel of the UI. The devil is from the details! Due to some personal things, February will be a very short month. So I will not be able to achieve much. Nevertheless, I plan to make progress on the background sprites and start designing the level. I also plan to fix some of my “not so priority bugs” but “things that looks not so good in the game” bugs. Not a big issue at the moment as the focus is on the IRIDIUM game, but am very interested in the software. I also had a look on your amiga projects and I'd love to see those games running in the futur. A small update for a small month. Next month will be better, I promise! February is always a short month, but especially this year for me as I took 2 weeks of vacation. It was nice! Some important bugs were fixed, as well as some minor ones. I also added some small features I forgot to implement before, like being able to choose the color of the small light being spawn where an explosion occurs. I’m still making progress on the 2D level Art, and it’s going well. I hope I’ll be able to share some pictures very soon. I also did some modifications to the editor and to some tools and workflow: it’s a big reason of why I’m doing a 2D level. I knew that I’ll find that some tools which are working well in 3D will not be as consistent with the 2D workflow. For instance, I added an orthographic view to help align things, and did a lot of correction to the snapping and grid code. It was a short month, and so it’s a short post. Thanks for the update suny, look forward to the next update. This will be very useful for building concept demos, to help entice coders/developers. March was a “bugs fix” month. This month I fixed some old and very annoying crashes and bugs, and it felt good. (OK) – when we reload a scene, the sprite rendering order is not the same. It should. (OK) – if we select the first waypoint and another one, we can moves the 2 waypoints. We should never move the 1st one. It can give you an idea of what is feel to work on a tool, and why it takes time. What a great hobby, coding tools and engine! The last 3 crashes where a pain to fix, but at the end, it felt good to be able to find the issues and correct them. I made progress on the beginning of the 2D level and on the end of level boss and added a new Kill trigger. I also modified the default grid snapping behaviour with multi-selection.